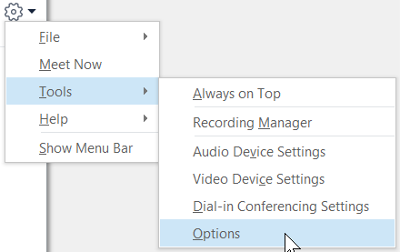 You can set up or change settings for any phone you plan to use with Skype for Business in the Skype for Business Options menu. IMPORTANT: If you want to change your phone number but can't because it's grayed out, it means your admin has set it for you, and is blocking you from changing it. Contact your admin (the person who gave you your account information) and ask them for permissions to change your work phone number. At the top of the Skype for Business main window, click the arrow next to the Options button and select Tools > Options. In the Options menu, select Phones. Click the box for the type of number you want to add or change, and enter the number. Use only the digits 0123456789, and no parentheses or hyphens. When adding international numbers, type the + sign, then the country code, followed by the local number. To make this number visible to contacts, select the Include in my contact card check box next to the number. Who can see my phone numbers? Work Phone is visible to all contacts except your External Contacts and Blocked Contacts. Note: Some companies don't allow you to clear the Include in my contact card check box for your work phone. Mobile Phone is visible only to your Workgroup and Friends and Family. Home Phone is visible only to your Friends and Family. Other Phone is visible only to your Friends and Family. Use this option to add or modify additional numbers, like for a temporary office or an alternate cell phone. Note: To see which of your contacts have each of these relationships with you, in your Contacts list, select the Relationship tab. Contacts are grouped there by privacy relationship. To change the relationship you have with a contact, right-click the contact listing, and then click Change Privacy Relationship. For more details, see Control access to your presence information in Skype for Business. Text telephone (TTY) mode is used for text communication over a telephone line. A TTY device must be connected to the computer to interpret the modified audio; otherwise you might experience poor audio quality during the call. Using TTY mode in a conference call may also cause audio quality issues. Connect a TTY device to your computer. Under Phone accessibility, select Turn on TTY mode. Sign out of Skype for Business, and then sign in again.